(Talk about a front row seat! I wrote this first paragraph standing on-stage at the T-Mobile arena in Las Vegas). 6pm: the band just finished their sound check. A few minutes ago, Barbra asked to listen to the background vocal parts on “Evergreen”. Once satisfied, she’s asked to hear a new ending to “Papa, Can You Hear Me?”. She wants to extract every last drop of emotional impact from the song for the finale of ACT I, but there seems to be a missing note in their harmony triad. The search is on to resolve it…and quickly. 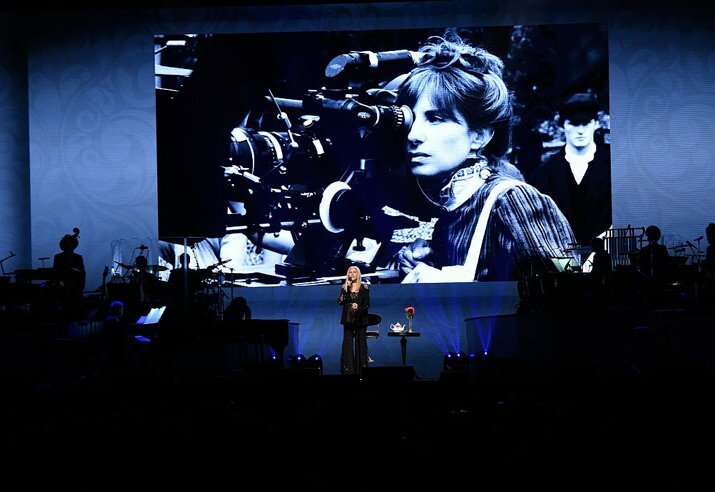 Barbra is simply brilliant at hearing notes in her head… but it sometimes takes a bit of trial and error to translate those notes to the musicians. Somehow though, she always makes the arrangement better. Improvement time is over… the arena manager wants to start letting patrons in because they’re literally melting in the 100+ degree heat outside. 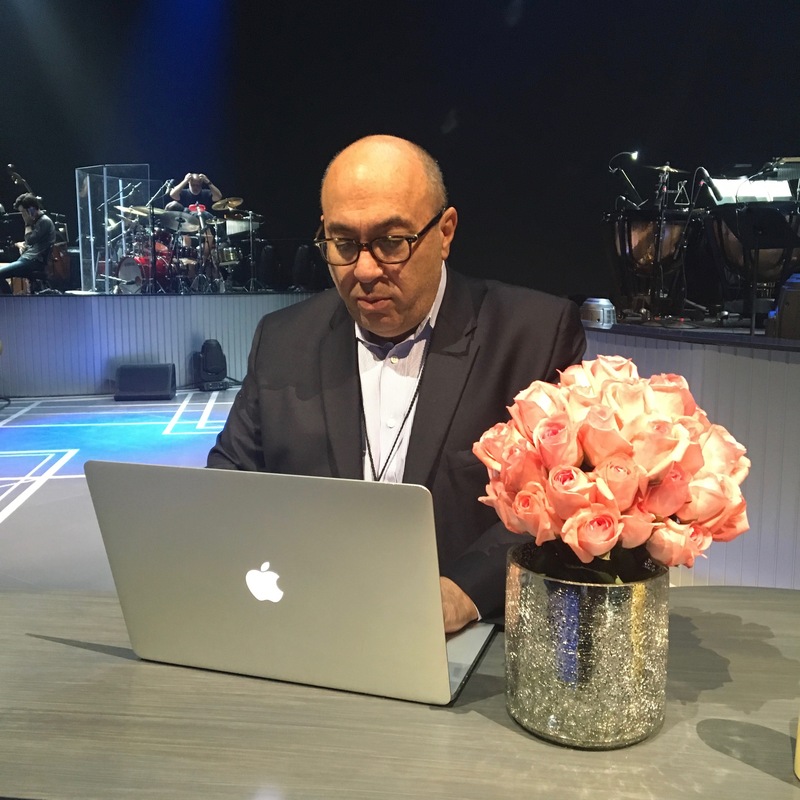 At 8pm there were still a few “housekeeping” details that needed to be addressed, so Barbra, Richard Jay-Alexander and I retreated to her dressing room to make some minor script tweaks. The goal is to remain current with national events as well as weaving in some specifics about each city we’re in. So if Barbra’s read or heard something interesting she’d like to share with her audience, we discuss how to reduce the idea to its essence and then “Barbra-ize” it (meaning Barbra says the lines aloud to make sure the idea is clear and conversational – nothing stilted or highfalutin is allowed). 8:15pm: I took my seat next the soundboard helmed by Chris Carlton. 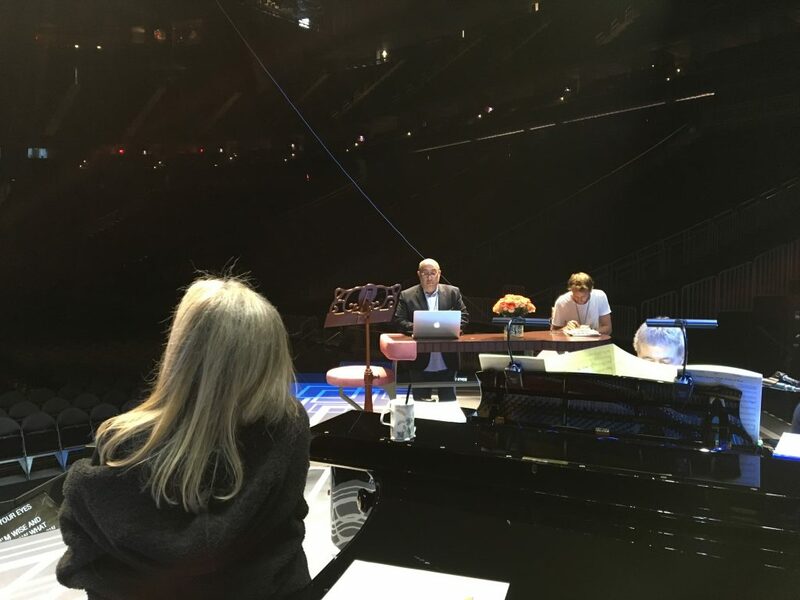 He’s been in charge of Barbra’s sound for the past two tours and somehow makes every arena, no matter how acoustically challenged or unforgiving, sound full yet intimate. The Show? Oh yes, the show! Stellar! Magnificent! Spine tingling and tear inducing. Barbra was, as the saying goes, of voice! Among the highlights tonight, another heartbreaking version of “You Don’t Bring Me Flowers”. I mention that song in particular because her introduction was particularly revealing. Someone had sent her a review of the San Jose concert (which I should add was 1,000,000% glowing), but passing reference was made that her lyrics and dialogue were scrolling on a Teleprompter. She explained to the Vegas audience that although she writes every word of the show, the prompter is like a security blanket because she doesn’t want to forget anything. She went on to describe the “terrifying moment” when she was singing for 150,000 people in Central Park in 1967. She forgot the words to one of her songs and the feeling was so traumatic that she didn’t perform live again for 27 years. It was only when she learned that Teleprompters could be used in a concert setting, that she reluctantly agreed to return to the live stage. From my point of view, it seems like a no brainer – if the prompter gives her that extra little bit of confidence, then I say, bring it on. I’m there to marvel at the voice, the person and the artist – the prompter doesn’t diminish her gifts or our enjoyment in receiving them. If some nit-picky critic thinks it’s even worth mentioning, they’re really missing the point. 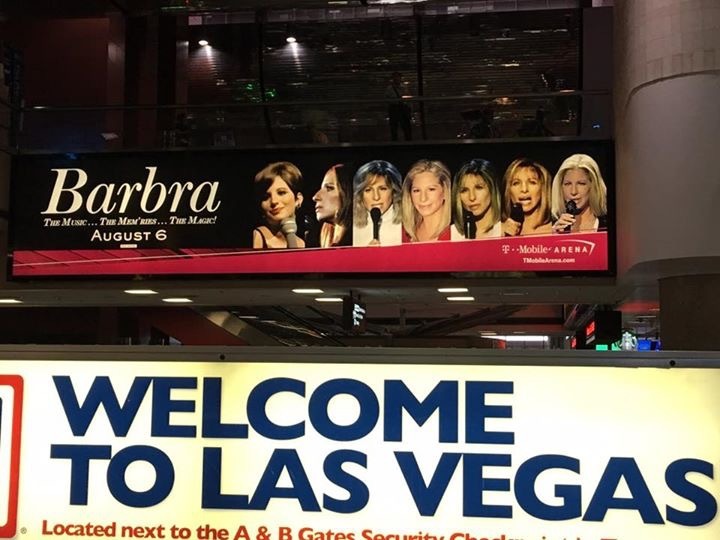 Besides, no one, least of all Barbra, is trying to hide anything. Prior to each show, our production assistant Emmalie Faye sits with the Teleprompter operator loading all Barbra’s script changes into the machine. Barbra may only glance at them during the show, but if a brain freeze ever does set in, they’ll be there to keep her on track. It may be a little crutch, but as she reminded the audience with tongue only slightly in cheek, “At least I don’t lip-sync!”. The audience roared in support and approval. I don’t know if words can do justice to how incredible Barbra Streisand was tonight, and how amazing this show is. Spellbinding. She held the audience in the palm of her hand the entire night. Conversational, laid back, yet still impeccably elegant, and still undeniably powerful. She gave 1000% on every number, and it was incredible to hear so many songs that I never thought I would hear live. Every song was a home run. On top of that, this was an incredibly beautiful, stripped down show. Amazing work from everyone involved in this show. Lauren Lopez at T-Mobile Arena, Las Vegas. I’ll never have the words to properly explain what Barbra Streisand has meant to me in my life. And tonight I had the opportunity to sit between my Father & Mother and witness her genius from 20ft away. It may seem insignificant or frivolous to most, but to me these are moments I will cherish forever. So incredibly happy and extremely thankful! After the show, Richard Jay and I were so pleased with how the Vegas show had gone, then we celebrated with Nathan’s hot dogs (at 1am) and then spent a ½ hour at the Black Jack table where we both came away winners! The entire touring party leaves for Chicago tomorrow for two days of R&R, and I’m off to NY where I’ll be filming an “Encore” related project with Alec Baldwin.